The belief in healing stones, healing crystals or the magical healing properties of stones is not new. In fact, belief in the supernatural power of rocks, that they can heal, provide wealth, or protect, goes back beyond recorded history. An early cuneiform tablet gives a list of healing stones that will help with conception and birth. History is full of legends and lore about the mystical and magical power of stones, including legends from Atlantis, Egypt, Sumeria, Babylonia, the Hindu culture, Ancient Greece and Rome. Nearly every culture has its own beliefs about specific stones, and those beliefs are often tied to that culture's legends, lore, history, geography, and spiritual practices. But surprisingly many of these beliefs are often similar! Up to the 19th century, rocks were commonly used as medicine against illnesses. Natural gemstones were laid on the afflicted area of the body or minerals were crushed and taken internally. The earliest records of crystal healing come from ancient Egypt. A hieroglyphic papyrus from the year 2000 B.C. documents a medical cure using a crystal. A 1600 B.C. Egyptian papyrus listed the medicinal value of stones including Lapis Lazuli, Carnelian and Quartz crystals. Healing with crystals is also recorded in India’s Ayurvedic records and in traditional Chinese medicine from around five thousand years ago. Several shamanistic cultures still practice crystal healing, including the Inuit of Canada. In fact, recently a resurgence of these ancient legends and lore has fueled the metaphysical world. Turquoise was valued by most ancient civilizations, including the Aztecs, Incas, Persians, Egyptians, and Native Americans. There are more legends associated with turquoise than with any other gemstone. One legend says that a piece of turquoise thrown into a river will bring rain. Turquoise mines in the Sinai Peninsula were worked as far back as 5500 B.C. Turquoise was believed to prevent accidents, and to cure diseases of the head and the heart. The ancient Egyptians believe turquoise could heal cataracts. In fact, turquoise, carnelian, and lapis lazuli were the most used gems by the ancient Egyptians. It was also believed to make one invulnerable and it was placed on body armor, turbans, swords and knives. Turquoise was sacred to many Native Americans and was often carved in the shape of animals and birds. These carvings were placed in the Native American tombs to attract beneficial spirits, and to guard the dead. Turquoise was used by medicine men for healing and by warriors who fixed turquoise to the end of their bows to insure accurate shots. The Navajo believed that Turquoise placed in the opening of a home would bar the entrance to evil spirits. The Zuni believed that Turquoise protected them from demons. It was commonly believed to several tribes that Turquoise would protect the wearer from injury from falling from their horse. Even today a lot of horse tack is decorated with Turquoise stones! Ancient Chinese people were fascinated by stones that exhibited a chatoyancy or inner glow of light, either as a moving line, for instance Tiger's Eye, or as in a star, for instance star Ruby. These were thought to bring good fortune to the wearer. Tiger’s Eye has been known for thousands of years and has many medicinal and mystical properties associated with it. Roman soldiers wore Tiger's Eye for protection in battle, and the stone was thought to be all-seeing due to its "eye" appearance. It is said to to protect the wearer from evil and illness too. Tiger’s Eye was often worn by children for protection. The name Chrysocolla was first used by Theophrastus in 315 B.C. Lore states that Cleopatra carried Chrysocolla stones wherever she went. It was believed that Chrysocolla would help make those who had volatile tempers more sensitive and tolerant, and those that carried this semi precious stone would have more creativity and femininity. Women believed it made them strong and beautiful. The legend is that this stone improved communication skills and soothed the people around you. Native American cultures believed it could strength the body and bring about calm when one was upset. Jade has had a long history and lore as a healing stone, and has been known to man for at least 7,000 years. A sacred stone to the Chinese and Mayans, Jade has been widely used to carve sacred symbols and used in religious ceremonies. The Chinese believed Jade could strengthen the body during life and protect one after death. The name Jade came from the Spanish Conquistadors term "piedra de ijada" or "colic stone". The term was coined when the natives of South America were observed using the stone for kidney ailments. Ancient Romans believed that Lapis Lazuli was a powerful aphrodisiac. The Buddhist beliefs state that Lapis is a healing stone that brings inner peace and freedom from negative thoughts. It Ancient Egypt, Lapis was crushed and made into a poultice that was then rubbed into the top of the head. It was believed that as it dried it drew out all spiritual impurities. Dreams involving lapis were said to bring lasting love. An Ancient Greek cure for eye problems was to place a piece of Lapis in a bowl of warm water, leaving it under the night sky for a few minutes. The water was then used to bathe the afflicted eye. Agate was discovered with the Stone Age man in France 20,000-16,000 B.C. But scientist believe that some agates in Austrailia range from 2.72 to 3.50 billion years old! Agate was highly valued by ancient civilizations, as it was believed to render the wearer invisible. In Islam culture, Agate is believed to protect the wearer from tragedies or evil. In many legends agate is believed to cure the stings of scorpions and the bites of snakes, soothe the mind, prevent contagion, quiet thunder and lightning, secure the favor of the powerful, and bring victory over enemies. The Babylonians used eye agates for protection against evil. The ancient Egyptians believed that agates protected the wearer from lightning, bestowed the power of speech, and quenched thirst if you put it in your mouth. Persian magicians used agate to divert storms. Ancient Chinese believe wearing agate jewelry stones would purify one's mind, energize one's chi and bring good luck and great opportunity. The practice in Medieval times was to tie them to the horns of your oxen to ensure a good harvest, but the danger was in possibly losing your oxen if they became invisible before you could remove the stones! Jasper was a favorite in the ancient world, and its lore can be traced back in Hebrew, Assyrian, Persian, Greek and Latin. It is mentioned in the Bible several times. People of the 4th century called it a "rain-bringer". Legend states it was used to drive away evil spirits and protect against snake and spider bites. Many amulets made from jasper were found in Egypt with scripture inscribed on the amulet to protect the wearer from death. The Ancient Greeks valued jasper, believing it would ease the pain of childbirth if tied to the woman’s thigh. Jasper was used as a talisman to prevent drowning and scorpion bites. It was often worn by Shamen to provide protection. Some Native Americans lore claims that jasper would bring rain, and that it would protect against unseen dangers in the night. Malachite was mined as early as 4000 B.C. by the ancient Egyptians, who attached it to children's cradles to drive away evil spirits. In the Middle Ages, Malachite was believed to protect against the evil eye, black magic and sorcery, and to cure various types of stomach ailments. The pharaohs often had their headdresses lined with Malachite in the belief that it helped them to rule wisely. In some parts of Germany, Malachite was believed to protect the wearer from danger in falling, and it also gave warning of approaching disaster by breaking into several pieces. 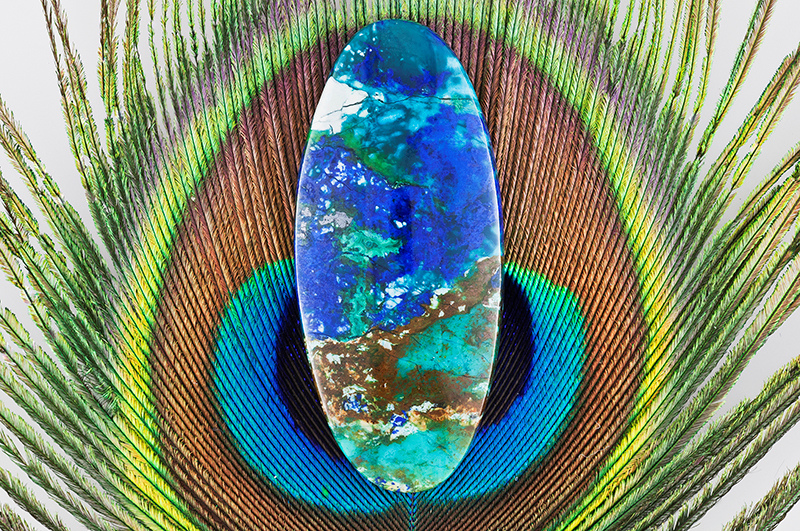 Azurite was sacred to the Egyptians who believed it was an aid to spiritual communication. The temple priest used it to paint a third eye on their forehead, believing it increased their powers. In Ancient Chinese lore it was believed that it could open the door to spiritual heaven. Legend also says it is the stone that was used for general healing in Atlantis. Its power was a secret known only to the priest-that secret is now lost forever! Ancient Greeks used it in healing ceremonies, calling it Caeruleum. In Native American traditions and lore, Azurite is considered a sacred stone and is used to connect to spirit guides. Many other stones have similar legends and lore. The ones I have featured are ones you are likely to see for sale here! Even ordinary Granite has history. In Ancient times it was revered by the Mayan nation, and the Aboriginal tribes of Australia still consider the stone to be sacred and magical. They believe it can provide protection and an increase in money.